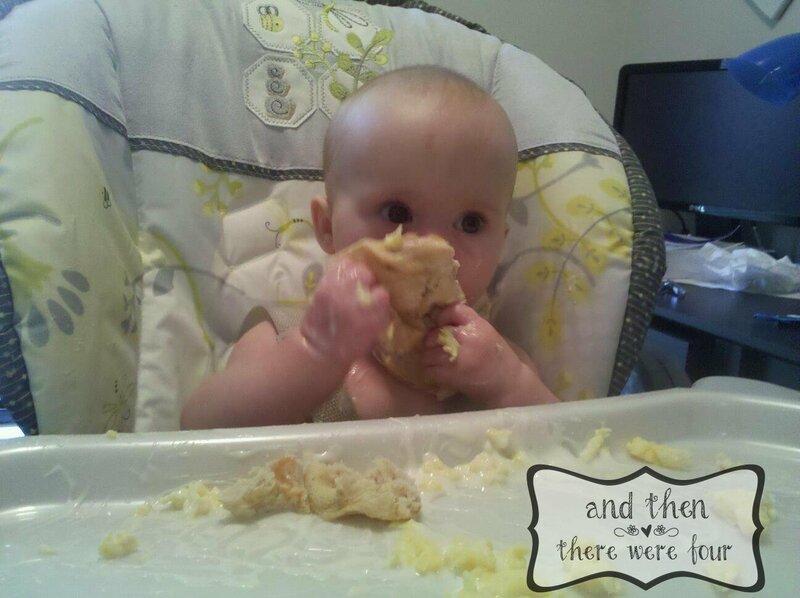 I wanted to share some information on Baby Led Weaning, if you read my last post you may have seen some photos of Bubby eating chunks of solid foods and my mention of BLW. 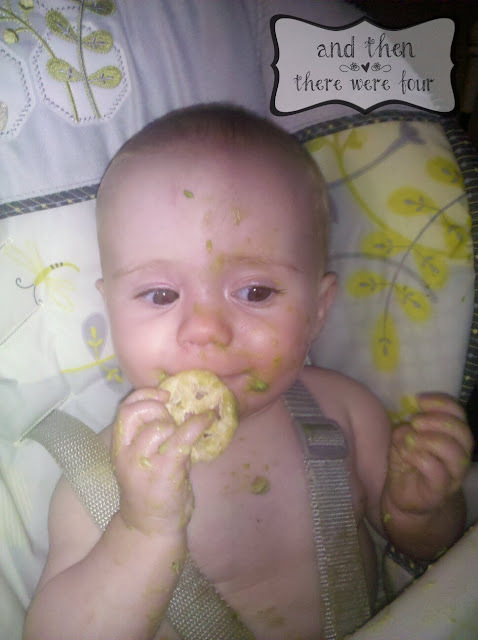 Some people are a little alarmed when they see my babies eating solid foods rather than pureed foods at 6 months old... but if you do a little research you'll find that it's a great way to start your little ones on solid foods! This site is great for BLW and Pureed babies alike. It has a large source of information for what types of food are best for certain ages, there are recipes for both, information on BLW and more! This is a board from Babycenter.com's Community Forum. These women are a WEALTH of information! This site is amazing... 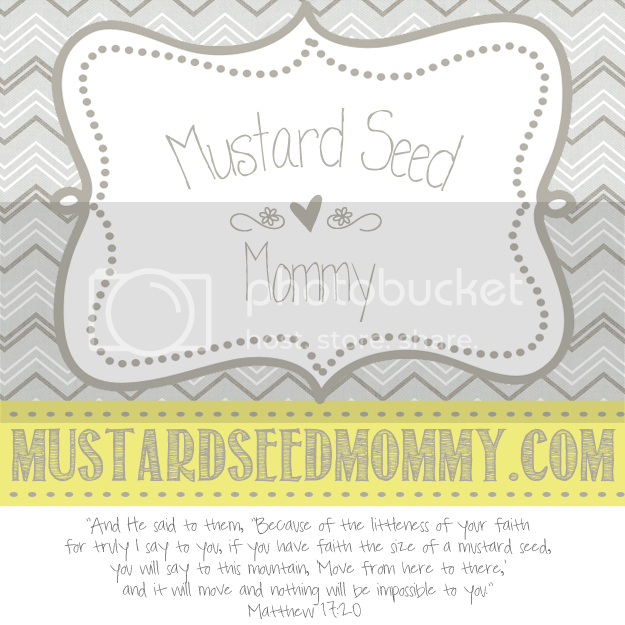 The page I link you to is a great place to start if you want to learn more about BLW! There are mixed emotions and opinions when it comes to EVERY decision a parent makes for their children, just peruse through the communities on Babycenter to see argument after argument, debate after debate on everything from breastfeeding to giving solids to car seats. Now, in some instances, especially when it comes to safety, there is a RIGHT way to do things and a WRONG way to do things (i.e. 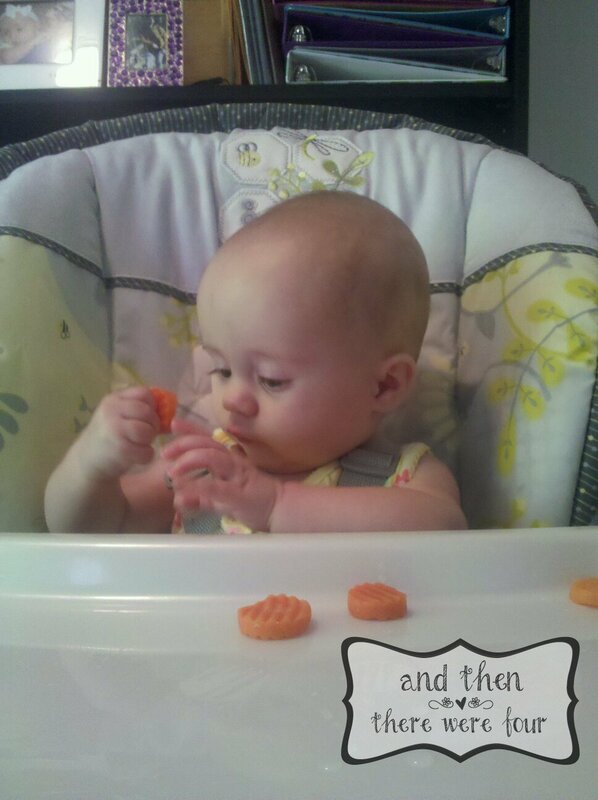 forward facing TOO soon in a car seat).... with feeding however, there are a few ways that this can be done. 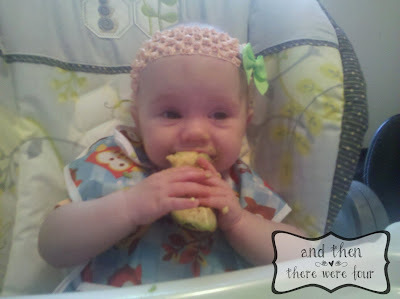 So, all of that was to say that while I think BLW is the best way to start your child on solids, it's not the only way. If you choose to go with pureeds, more power to you... I think they are gross. What I have told our family is that if I won' eat it, I won't make my child eat it. No, thank you. BLW is best started after your child turns 6 months, when they are sitting unassisted (steadily and securely), are making the chewing motion with their gums, and when you feel they are 100% ready. You want to make sure they aren't going to be forcing food out of their mouths with their tongues, this is called the tongue thrust. That is a sure fire way to know if they are NOT ready. A lot of mother's also wait until their children have perfected their pincer grasp... I don't wait for that myself, I have found that with both of my children they didn't perfect that until nearly 9 months and they were ready for solids prior to that. There are also many different views on how to go about BLW. 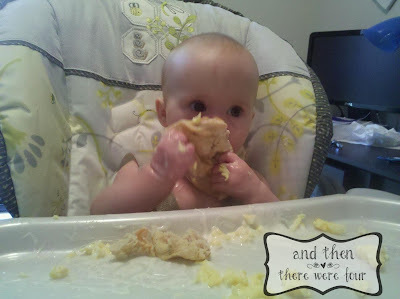 But first, what is Baby Led Weaning? Essentially, BLW is skipping pureeds and spoon feeding and allowing your child to dictate what they want to eat on their plate/tray. You can give them diced foods, mashed foods, large chunks of food, you have to go by what you feel your child can handle. I did this two different ways for my children. 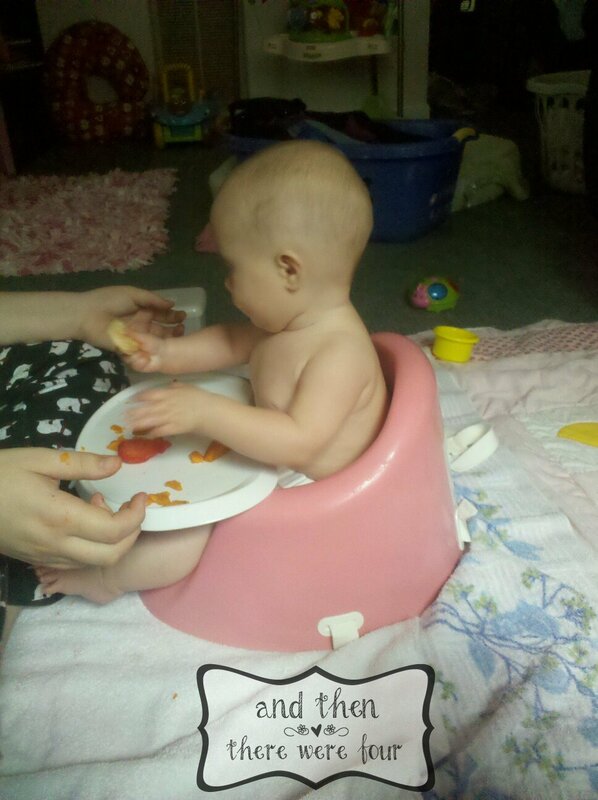 With Boogie, we gave her large chunks and dollops of pureeds (yogurt, applesauce, etc.). She handled large chunks better and enjoyed it more because she could gnaw and take tastes of whatever was in front of her. 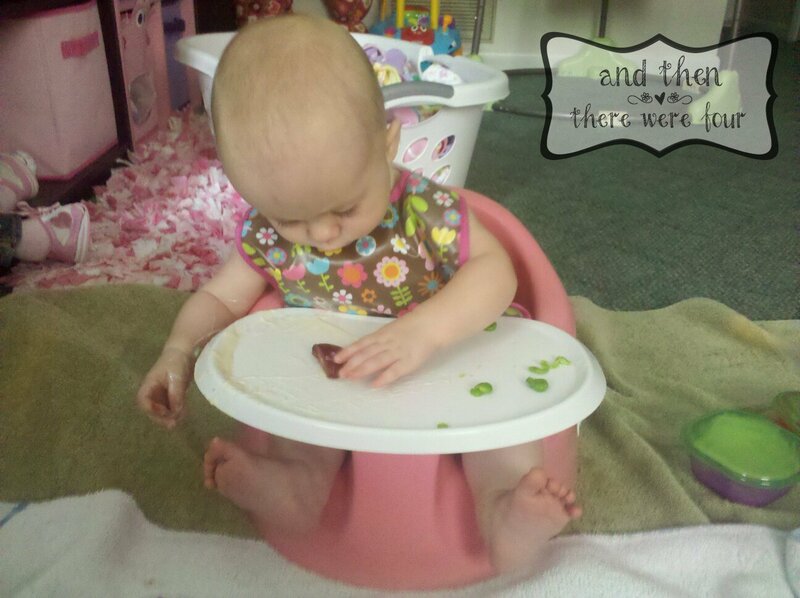 After about 2 months I started dicing more foods up once she perfected her pincer grasp. With Bubby, we tried large chunks but he just didn't show as much interest that way. Instead, I tried smaller diced chunks and he took to it right away. He doesn't have his pincer grasp perfected, but boy can he shovel that food in! Wholesome Baby Food has some great charts HERE to give you a good indication of what foods are appropriate for your child's digestive system by age. It starts at 4 months, but I don't feel any child is ready at that age. So I linked you to the 6 month chart. Some foods we started Boogie with were avocado, bananas, apples, zucchini and squash. 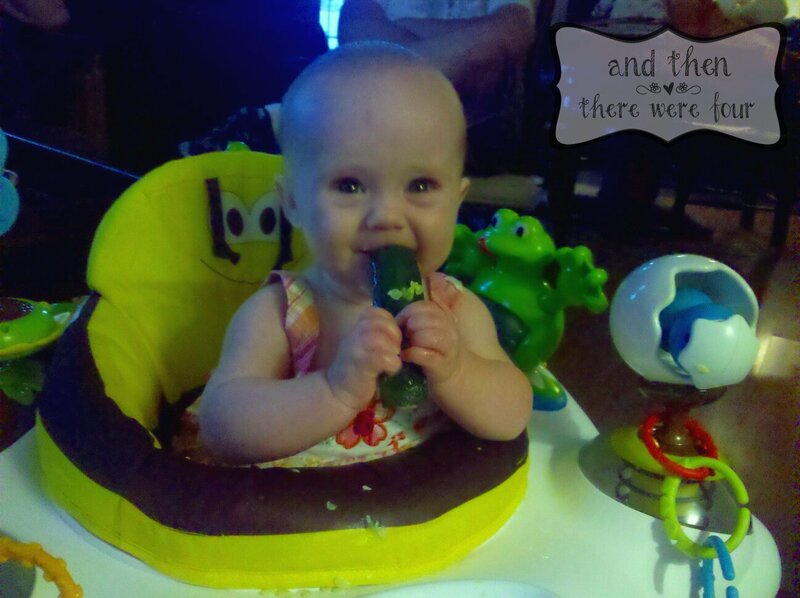 Her favorite was always avocado and bananas. Bubby we started with the same and I introduced chicken earlier with him. So far his favorite has been avocado as well. It's highly recommended to not place food in your child's mouth for them, and while we usually don't do that, with Bubby, in order to get him interested in eating what's in front of him (he's usually too busy watching everyone else eat he doesn't see that we've given him food!) I take a tiny taste and place it on his tongue. Once he gets a taste he starts devouring whatever is in front of him! The important thing is that you aren't the one feeding them, you put food in front of them and allow them to choose what they taste, eat, and like/dislike. Just as with on demand breast feeding, you allow them to show you how much they want. Sometimes they want have any interest, and that's ok. Food before age 1 is solely for learning and enjoyment. Breast milk (or formula) has all the essentials they need before age 1. The most important tip I can give any parent, for ANY decision you encounter regarding your child, is to RESEARCH. Don't just rely on word of mouth, what your family thinks is right, or even what your pediatrician says (yes, they are educated, but do they know your child as well as you do?). Research, research, research. Come to your own conclusions and then ask questions.